The cult of Baphomet has been delivered a critical below, yet the demon lord remain undeterred. Now he's taken hostage the herald of Iomedae, goddess of justice and valour. The heroes of the Fifth Crusade must attempt their most dangerous and audacious mission yet - travel to Baphomet's Abyssal realm known as the Ivory Labyrinth, navigate its trackless mazes, and find the ancient prison in which he's keeping the abducted herald. Can the heroes rescue the goddess's messenger, or are they already too late? And was the abduction merely a ruse by the demon lord to lure the heroes into his clutches? 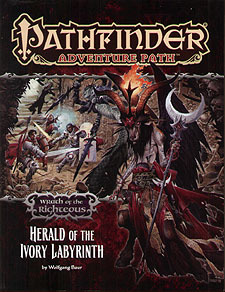 "Herald of the Ivory Labyrinth," a Pathfinder RPG adventure for 15th-level characters with 7 mythic tiers, by Wolfgang Baur. A look into Baphomet - demon lord of beasts, labyrinths, and minotaurs - and the workings of his sinister cults, by Sean K Reynolds. An exploration of the foul fiends known as demondands and their place in the Abyss, by Amanda Hamon. Betrayal and bloodshed in the Pathfinder's Journal, by Robin D Laws.